I’m an amateur kayaker. I know there’s not much to it, some shoulder rotation and the dipping of a paddle from side to side that causes you to glide through water but for the times when I needed to pull up along side the person I was kayaking with I found the craft tough to control. I couldn’t turn or avoid crashing into my partner when I was getting too close. It’s fair to call me a kayak spazz. Give me a wide river with no rapids, waterfalls and plenty of sunlight and I should be fine. 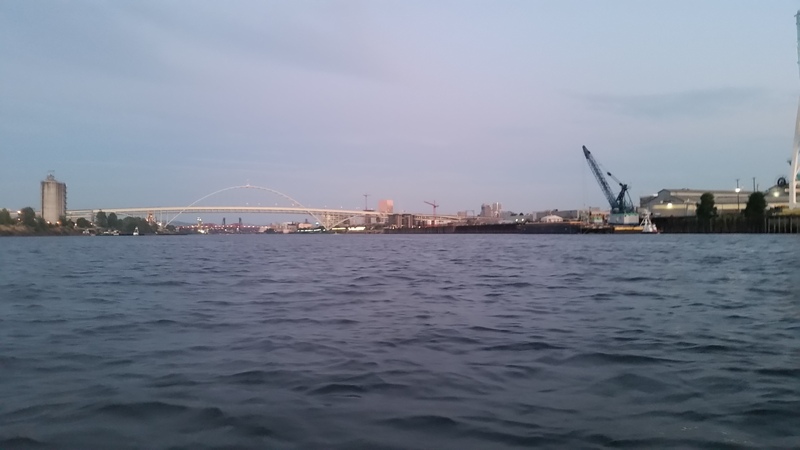 My wife, Ronna, and I set out for a kayak cruise to downtown Portland on the Fourth of July to see fireworks. We gave ourselves plenty of time beginning this journey at the St. Johns boat ramp around 7:30pm. If you’re familiar with Portland you know that’s a long way, but it was sunny, warm with a few more clouds than I expected and I accepted the mission. I was concerned about paddling back in the dark but was more focused on the first part of trip–get to the fireworks and watch them. I considered lighting but only had a miniature flash light that would not have done much so I left it at home. We had no marine lighting in the house. After we piled the boats in the car hanging off the tailgate we headed to the boat ramp. Once in the river we were surrounded by thin bands of pink clouds from an epic sunset. Everything was gorgeous from the reflections of the water to the light of the setting sun. People were camped out along the river bank. I listened to a woman haranguing someone from inside a tent. Otherwise it was quiet with the occasional boat creating a wake that had us bobbing up and down. The water that splashed on me from time to time was warmer than I thought it would be. We drifted past a giant navy ship, the USNS Charles Drew that was docked around the Vigor ship yard. Fireworks were starting early, before it got dark. We kayaked under five bridges getting a different perspective as we passed underneath them. Heading toward the Broadway bridge as it grew dark, we passed a small boat with a light on its stern. When asked if we were heading for the fireworks, I confirmed we were. The boat light was bright and seemed like a good idea but the people were giving up, calling it a night, turning away from the fireworks. People gathered on the Broadway bridge–an ideal place for firework observation. One of the onlookers yelled, “Shark” down at us. This was the least of my worries. We where heading under the Steel Bridge when a spot light hit us. A man asked if we had a light for our kayaks. Ronna said we didn’t. He told us that we were in the middle of the channel and that we needed to go home before we were killed by a boat that wouldn’t be able to see us and would crash into us. (I’m paraphrasing here.) Needless to say this condemnation put a damper on our kayaking adventure. I admitted that this was good advice. Seeing the lettering on the side of the boat, I realized we were dealing with the Coast Guard. I didn’t want to risk further run-ins with them so I was ready to head back. Ronna was determined to see fireworks. We pulled over to a dock on the shore before the bridge and talked to a couple of guys who had seen our encounter. I was willing to continue mainly because I thought we were almost there. It seemed like the whole sky would open if we could elude the Coast Guard and get under the Steel Bridge. Instead we ran into a giant concrete barrier that stretched on and on and blocked our view of anything. We saw people lined up on this bridge too and caught flashes in the sky, otherwise we heard or saw no evidence of a firework display. We regrouped again back at the dock and realized we weren’t going to make it. We had lost our chance to see the Portland fireworks display. 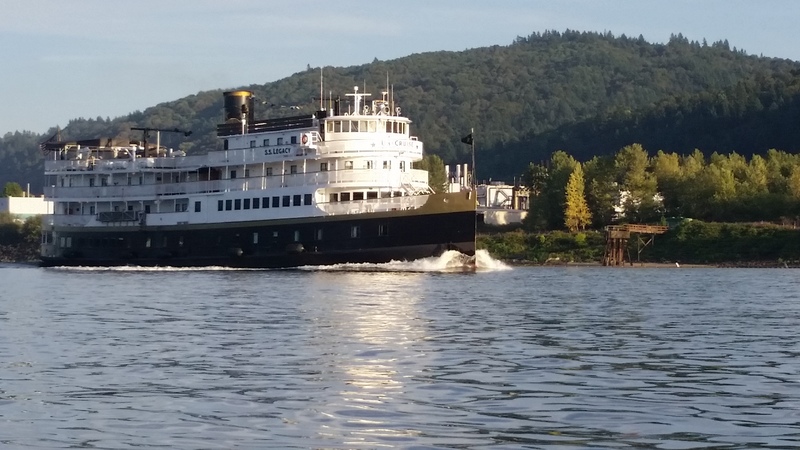 Ronna expressed regret about experiencing what felt like bully tactics from the Coast Guard. It occurred to us that we should hug the dock for a few minutes. With everyone heading up river after the fireworks we hit some serious wake action. Rogue waves sloshed into the kayaks. We were tossed back and forth but it’s hard to say how challenging it would have gotten if we hadn’t stopped at the dock. We headed back closer to the shore as not crash into any stray boaters. The lights from the bridges made amazing reflections on the river’s surface. We caught amateur firework displays, saw camp fires along the river bank, spotted fish jumping around us and even saw a falling star–nature’s fireworks. By the time we loaded up the boats it was 2:30am. After seven hours of kayaking I had to wonder if it had been worth it. 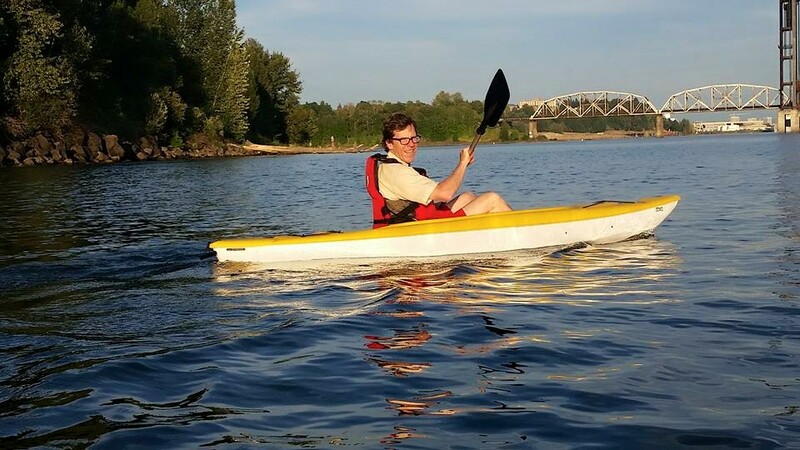 I learned that I could kayak for that long without my arms falling off. I wasn’t disappointed about missing the fireworks because we survived. Despite the Coast Guard’s warnings, we didn’t get chopped up by a giant ship propeller or collide with a pleasure boat. There would be future opportunities to see fireworks. That night I saw the river from a perspective I never expected. It’s a stranger world in the dark. We experienced the river with its strange, late night industrial noises in the industrial section to crazy boaters blasting tinny music from mounted speakers. One passenger hanging off the back of a speeding boat, while it was still light, mocked me by making exaggerated paddle motions but a slow cruise up and down the Willamette had me experiencing the river in all its lit and unlit glory. It’s summer in Portland and while I try my best to enjoy it and appreciate it, I’ve found myself breaking from my usual style. I’m writing more personal blog entries about my Portland experiences. The planning and more general subject matter isn’t far off. As my old friend Peter Geddes pointed out: August is a slow news month. July seems like one too. I’ll be back Friday, July 24th. I swear!